Brightly colored exotic ice cream to brighten up your day awaits you on Pioneer Boulevard in L.A.'s unofficial Little India. 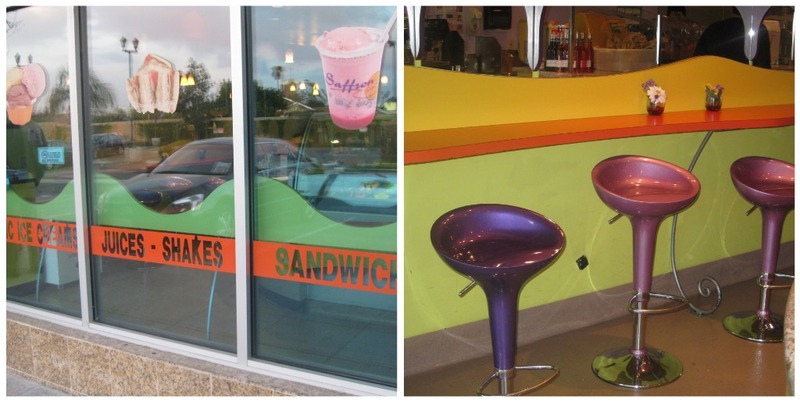 Saffron Spot is a small store (many times you'll see people eating outside at a little table instead), with a brightly-colored interior that is the perfect complement to its brightly colored ice cream. It does offer a few non-ice cream snacky things (including samosas and a chutney sandwich), but the ice cream is so exceptional that I haven't managed to move past that yet. 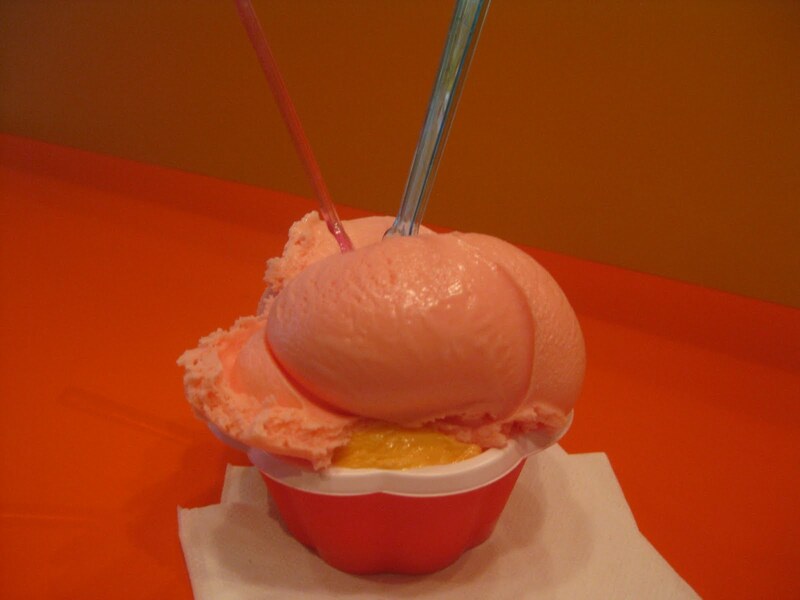 It also offers exotic milks (like rose), shaved ice, and hot drinks (like masala milk). There are typically 16 flavors available and on display. I love how colorful the display is. It's like edible Play-Doh. The restaurant has more than 25 ice cream recipes in total, so be sure to go back more than once to see what new flavors are in the case. 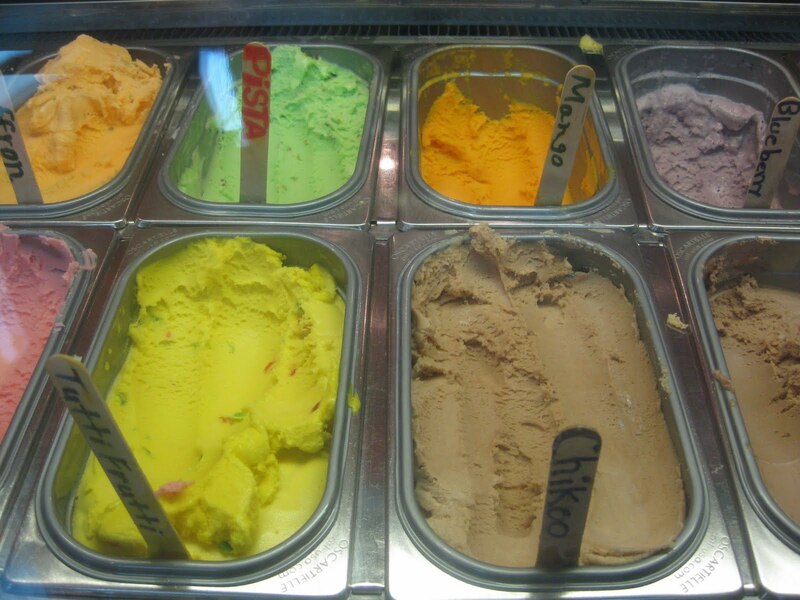 Plus, there are also slices of kulfi (a super rich Indian ice cream) available, which I've been meaning to try. I also just found out the restaurant can make you a milkshake of any of its flavors. Hmm...we've been having 90-degree weather recently, right? Surely, a milkshake is justified. In addition to milkshakes, the restaurant can make you something called a falooda, which I'm intrigued by but so far scared to try. (I'm usually super adventurous with food, but at certain places, I get scared to mess up a good thing.) Basically, it's four mini scoops of ice cream on a bed of rice noodles and topped with rose syrup and basil seeds. Parking is easy. It's part of the Little India Village, and so shares a private lot with the neighboring businesses in this two-story Indian mini-mall. However, beware the parking nazi. He once literally chased me out of the Little India Village parking lot, yelling "move your car." Except that my car wasn't parked in that lot...yeahh, awkward. I was actually walking back to my car at the time. I almost always park on the street (there's a lot of free street parking around), because I'm just the type of person who actually likes to walk in L.A. Plus, in this particular neighborhood, it's fun to window-shop. 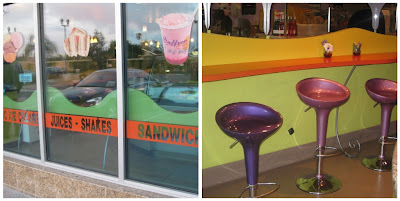 Have you been to Saffron Spot? What's your favorite flavor? Anyone tried the falooda? Saffron Spot, 18744 Pioneer Blvd., Artesia 90701. (562) 809-4554. Looking at the way huge the level of interest is certainly related to the fashionable, everyone center has to be the fact that for getting a good issuer, available for to offer you good, constructed patterns are sometimes made. replica prada Do not forget that whenever you might get hold of synthetic version, as a minimum come up with most of endeavors to invest in one is certainly effectively specially designed. Prada synthetic version shopping bags may not be to generally be unconsidered. replica cartier It seems that, one of many way followers, Prada sacks happen to be tremendously preferred. It is only natural along with the reputation of the fashionable. replica hermes Any case container provided by Prada stands out as the version the fact that right now prefers a striking level of popularity point. As just stated, fake hublot the provider or simply store where you can expect to buy synthetic version will have to be a good reputable an individual and also structure has to be mainly because on the genuine structure as they possibly can. chanel replica Right here is the girl in fact, to invest in items that does not are generally synthetic version.